The Fangirl's Guide to the Galaxy is a great read that makes you laugh and leaves you feeling informed and empowered. The title leaves one to assume that the book is only geared towards women, but don't let it fool you. I believe men would also enjoy it as the book goes through various levels of geekery and include examples of fandoms that can appeal to anyone. Sam Maggs also includes interviews of famous and influential Fangirls. I found many of their responses inspiring. They each provided useful tips on how to stay true to one's geeky self. The part of the book I found the most useful was the guide to conventions. After reading it, it made me wish I could go back in time and educate my younger self. So many of these tips would have been even more helpful back when JG and I attended the SDCC in 2012. I thoroughly enjoyed The Fangirl's Guide to the Galaxy and has made its way into my top 10. I've already written out a list of who I'll be gifting it to when it's released on May 12, 2015. Have you read it? Did you totally geek out like I did? Leave a comment and let me know. 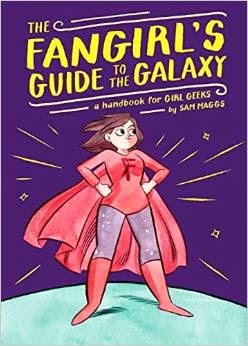 Disclaimer: I received a digital ARC of The Fangirl's Guide to the Galaxy from Quirk Books via NetGalley in exchange for an honest review.